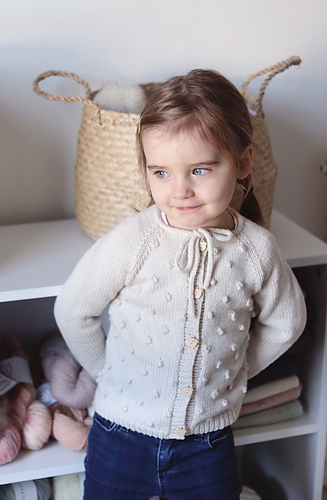 The Noisette cardigan has a bottom-up construction, with a nice popcorn stitch on the body. The sleeves are knitted in the round in stockinette stitch, and then attached to the body to knit the raglan decreases that will shape the neckline. 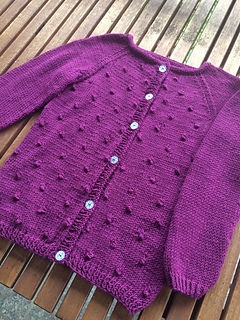 The cardigan is finished by an I-cord giving a feminine look. An option with a ribbing neckline is also included. Gauge : 22 st x 32 rows = 4’’ in stockinette stitch. 2, (2, 3, 3) 3, 4, 4, 5 balls of Rico Design Layette Baby Classic DK or about 280, (300, 350, 420)450, 500, 580, 600 meters of another DK weight yarn. Techniques : Knitting in the round for the sleeves, popcorn stitch, Icord, buttonholes, grafting. Le gilet Noisette est un cardigan qui se tricote du bas vers le haut, et dont le corps possède des noppes. Les manches sont tricotées en rond en point jersey, puis rattachées au corps afin de tricoter des diminutions raglan pour former l’encolure, qui est terminée avec un I-cord à nouer sur le devant. Une finition de l’encolure en côtes est également proposée. 2,(2,3,3)3,4,4,5pelotes de laine Rico Design Layette Baby Classic DK ou environ 280, (300, 350, 420)450, 500, 580, 600 mètres de laine DK. 5 à 7 boutons selon la taille du gilet. Techniques : Tricot en rond pour les manches, Icord, noppes, boutonnières, grafting.